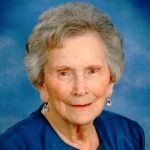 Melba Weaver Sportsman passed from this life September 4, 2018 at the age of 92. Visitation to follow the service at the church. Memorials: If desired, memorials may be sent to FBC Saginaw Missions Fund or Meals on Wheels. Melba was born and raised in Tyler, Texas by loving parents. She loved the Lord, her family, and friends. All who knew her remember her sweet smile and gentle words. Most of her years were spent in Tyler, where she retired from Tyler ISD. She later moved to Granbury to be with her family. She was a member of the First Baptist Church of Saginaw, Texas. Melba was preceded in death by her husband, Jack Sportsman; son, Lane Hamilton; father and mother, Howard and Dixie Weaver; brothers, John, James, and Harrel Weaver; stepson, Kelly Sportsman, and stepdaughter, Kim Emmel. Survivors: She is survived by her daughter, Kay Price (John); son Jeff Hamilton (Sue); brother, Dowl Weaver (Carmen); six grandchildren, Jeffrey Truly (Mindy), Scott Price, Tracy Adkerson (Tommy), Amanda Hamilton;, step grandchildren,; Michelle, Starr, Jack, and Kelli, eight great-grandchildren, and one great- great- granddaughter. 300 N. Old Decatur Rd. We loved Maw Maw Sportsman, Kimberly Ellison Which is her Step-m(Kelly's daughter) loved going & spending the weekend with her Maw Maw and Papa she will be Greatly missed. We Love you Maw_Maw! Rip Sweet One! I loved Melba Sportsman the first time I met her. Her sweet smile and gentle spirit reminded me so much of my own sweet mother, gone these twelve years. Every time we met, we hugged, kissed each other on the cheek and said “I love you.” I realized she had the capacity to make everyone feel as special as she made me feel. She was such a special gift from God. Kay, I know how much you are missing your mom, but just think about that reunion she’s having in Heaven, and that first meeting with her Saviour. Oh, what a glorious day, for her! She always told me what a blessing you were to her and what a special son-in-law John was. She was, indeed, a blessed woman, and we were blessed to know her. God bless you!